Are you sitting at your computer right? You’ve heard of “economics”, but what about “ergonomics”? 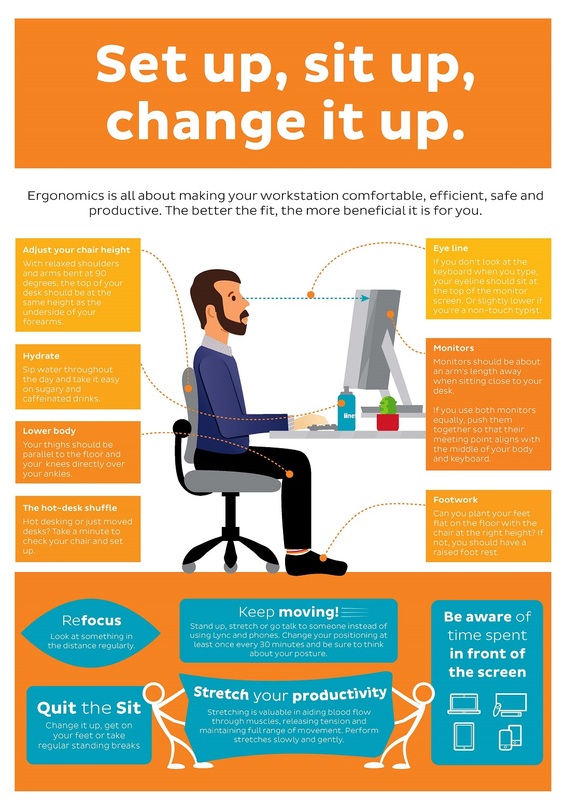 Ergonomics is the process of designing or arranging workplaces, products and systems so that they fit the people who use them. Safe Work Australia estimates the cost of work-related injury and disease to be a whopping $61.8 billion per year, so it’s a vital practice that should be done at home as well as the workplace. Chances are that you still spend a significant amount of time on a computer, whether it’s for completing errands like email correspondence or doing the weekly online grocery shop online, or for recreational reasons such as watching videos or playing games. However, if your workplace doesn’t involve daily work at a computer, chances are that you’ve never had anyone walk you through computer-related ergonomics to apply to your computer setup both at work and at home. Improper computer use can lead to eye strain, headaches and a whole slew of muscle and joint problems including the dreaded lower back pain, so that’s a problem that needs to be solved! We’re here to help with an easy-peasy guide to get you sitting comfortably so you can skip the strain that can build up over time. Whether it’s at work or home, if you use a computer, this info is for you! Adjust your chair height so the top of your desk is at the same height as the underside of your forearms. Your shoulders should be relaxed, with your elbows bent at roughly 90 degrees. Make sure your chair is large enough to support your whole body, with a back rest that can support the curve of your spine. Common lumbar support options are inflatable pockets of air in your chair or backrests that go up and down so you can get the support in the right spot. Your thighs should be parallel to the floor, with your knees directly over your ankles. If you’ve got all of the above sorted but you can’t get your feet flat on the floor, you’ll need to get a raised foot rest to support your feet. Your eye line should be level with the top of your monitor or, if you’re not a touch typist, slightly lower. Distance-wise, your monitor should be roughly an arm’s length away from where you’re sitting. The centre of your monitor should be aligned with the middle of your body, and your keyboard. If you’re using more than one monitor, make sure they’re lined up side by side with the centre of the displays aligned with the middle of your body. Make sure all the objects you’re using regularly are within easy reach to minimise any twisting and turning. Consider learning to touch type to reduce the amount you have to look down at the keyboard. A good floating or hovering typing posture encourages straight wrists, which reduces wrist and forearm strain. Stay hydrated – you should be drinking at least 1-2 litres of water every day, and keep sugary or caffeinated drinks to a minimum. Work out any built-up muscle tension by doing slow, gentle stretches on a regular basis. Make sure you’re keeping active – the Department of Health recommends 18-64 year olds engage in 2.5-5 hours of moderate physical activity or 1.25-2.5 hours of vigorous physical activity each week, including muscle strengthening activities at least 2 days a week. If you’re not exercising, don’t panic – doing any physical activity is better than doing none at all. You can start small and work your way up to the recommended amount. “Sedentary” means you’re spending a lot of time seated or inactive, which is particularly common among office workers and other professions which involve using computers for extended periods of time. It may surprise you to learn that sedentary work can be risky for your health even though there’s not much hustle and bustle. If you’re doing something that doesn’t require using your keyboard, like watching a video or taking a phone call, try doing it standing up. Mix up your computer time with other tasks that get you on your feet so you’re not sitting down for extended periods of time. Aim to take a 2-minute standing break every 30 minutes or so – you can even have a little stretch while you’re at it! You’re not “too busy” to take your break! Safe Work Australia advices that sitting for longer than 30 minutes without a mini-break and sitting all day at work are likely to be detrimental to your health in the long run. Not everyone uses their computer in the same place every day, particularly if you have a portable device like a laptop. 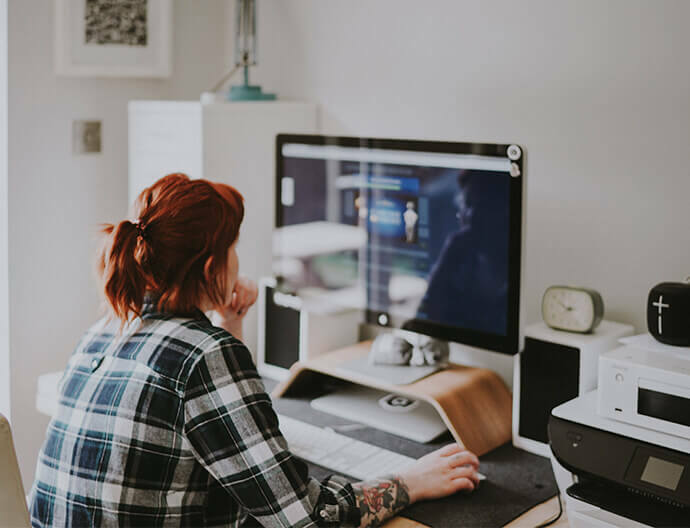 You may even be working in a modern office where you move between different desks on a daily basis (this is known as ‘hot-desking’) or you might just be moving about between different rooms in your own home. Whenever you’ve got your computer in a new spot, take a minute to get your setup in good order so you’re not feeling the pain later. To help you put all this information together and get a clear picture of how you should be setting up your computer desk, check out this handy diagram that’s packed with sound advice. Gina started working at iiNet in 2012 and she’s probably told you what to do at some point via setup guide. Her desk can be identified by a big mug of coffee and a few too many sticky notes. What is the correct setup for a stand up desk? Please. Hi David, this article has a pretty good diagram to follow (it also mentions the benefits of standing on an anti-fatigue mat) – https://examinedexistence.com/the-ideal-way-to-set-up-your-standing-desk/. There’s also some interesting insights from a man who’s been using a standing desk long term in this article – https://www.lifehacker.com.au/2016/06/four-things-ive-learned-using-a-standing-desk/. I’m a chiropractor and am seeing an epidemic of teenage poor posture due to prolonged iPhone usage. Any tips for teenagers to help avoid tight shoulders and the development of poor forward head carriage that can lead to lifelong postural challenges? Thanks. For those who wear multifocal glasses the monitor needs to be lower. This prevents the viewer from having to crane the neck backwards to get the picture in focus. Please note that the bolt up the bum posture fell out of fashion a number of years ago and is not recommended. It causes all sorts of static loading injuries particularly in the shoulders and neck. Have a look at this for a better understanding of managing the risk of MSK. Its from HP and is about as contemporaneous as can be. You may/should take down the current advice. The best kept secret of the computer industry is they made a big mistake right back at the AT keyboard stage when all new ideas got lumped on the RIGHT of the keyboard, eg number pad, navigation pad and then for right handed people the mouse was way out in right field, the perfect formula for sciatic problems. The sitting diagram above shows a worker looking at a screen with horizontal eye gaze. This is incorrect because as we age (from mid twenties) the small muscles holding our eyes, stretch a little and natural eye gaze slips downward to as much as 10 degrees below horizontal at the screen. I have to say I don’t subscribe to the tin soldier posture, preferring to relax in a well designed chair with good lumbar support, ensuring the mechanical loadings of the upper trunk, upper limbs and head are transferred to ground via the chair’s frame. This ensures the worker has less compressed discs and will feel less fatigued at the end of the day. I purchased one the other day and am eagerly waiting for the delivery. I want to know where I can get a desk/lectern like the one on the iinet advertisement.